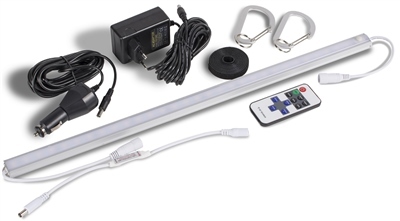 Awning and Tent lighting system is available as Starter and Add on kits. The Sabrelink™ lighting system ensures you're never in the dark. The system allows you to link up to three lights together . Each of our AirFrame awnings is SabreLink™ ready and can accept lights on the front AirPoles and also the centre poles. A Rally AIR 390, for example, could have three lights along the front and another three in the centre. Each system is controlled using a remote control that allows you to switch the lights on and off and also dim and brighten them. In our poled awnings, the lights can be hunt from the horizontal poles using the 'S' hooks provided. Please note: To ensure best performance, allow 20 seconds between turning on and off (don't turn on and off repeatedly).